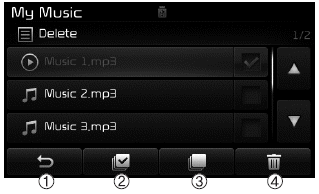 From the List screen, it is possible to delete files you previously saved into My Music. Press the button or individually select the files you want to delete. Once files are selected, the button and buttons will be enabled. After selecting the files you want to delete, press the button to delete the selected files. If there is memory available, up to 6,000 files can be saved. Identical files cannot be copied more than 1,000 times.